Welcome to Immaculate Auto Body Shop of Ocala, FL. 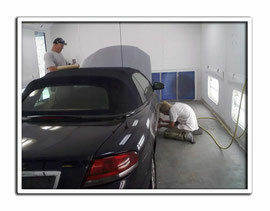 With over 30 years of collision repair and automotive painting experience, Immaculate Auto Body Shop will handle all of your vehicle painting needs. Whether it's your car, truck, recreational vehicle, van, or motorcycle, our 5,000 sq. ft. facility has the industry leading tools and technology to make your vehicle immaculate again. Our shop houses a frame machine and paint spray booth with a heating cycle for perfectly cured paint. We use computer matched DuPont paint and we stand behind our work to with our limited lifetime warranty. In addition to bringing your car to pre-collision status, we also offer dent removal, hailstone repairs, love bug repairs, and custom paint jobs. 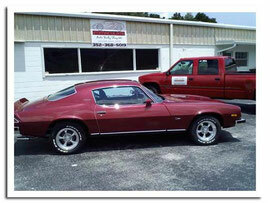 We specialize late and early makes and models of all foreign and domestic vehicles. Immaculate Auto Body Shop is located less than one mile from interstate I-75 and State Road 40, making it convenient to serve the Ocala, Dunnellon, Wildwood, Belleview, Williston, and Gainesville communities. Immaculate Auto Body Shop is family owned and operated with three generations of automotive body repair experience. Our commitment to you is to provide you with the same great quality repairs our family has come to expect for over 30 years. We continually strive for 100% satisfaction in all of our repairs. It's not just about your repair, we want you to trust us with all of your family’s repairs for generations to come. If you’re not satisfied, we'll make it right, guaranteed! We offer free estimates and can arrange for towing and car rentals. We are open Monday - Saturday, and Sunday by appointment. Immaculate Auto Body of Ocala accepts and welcomes all insurance companies, working closely with them to make your insurance claim easy and hassle free.